Human beings are made up of natural substances which also include water and air. Such natural substances maintain a smooth balance in order to facilitate a normal and a healthy life for the human beings. But certain lifestyle practices and some unnatural practices by the human beings destroy such fine balances and create deficiency symptoms such as zinc deficiency symptoms in men and women and this leads to body dysfunctions. Among all the natural substances, the human body has a very intricate balance of various minerals found naturally. These natural minerals exist in minute proportions but such proportions become important in sustaining life. Any imbalance in such minute proportions can create huge differences in the human life. One such important and crucial natural mineral that is present in the human body is Zinc. Zinc is a useful constituent of almost all cells of the human body. This important mineral assumes its importance because of its role in the defence mechanism or the immune system of the human body. Further, this important mineral helps in the natural process of cell division (especially required during pregnancies), cell growth, metabolizing other nutrients, breaking down carbohydrates in the human body, and healing any wound naturally. This important component also facilitates the human process of smelling and tasting. Zinc is also required for healthy skin, hair and nails. Further zinc is also an important requirement for maintaining eye health and protecting the body against different types of cancers. This mineral is also important for fertility and childbirth and thus needs to be consumed in the right proportion during pregnancy as well as nursing the baby. Since premature labor and lower baby weights can be avoided with zinc balances in the body. Zinc is also an important mineral which helps in the production of the male hormone testosterone. Thus zinc deficiency can have grave impacts for everyone, especially men. This crucial mineral certainly has an important role to play. However, a lot of the times our lifestyle practices which include our food habits cause an imbalance in the human body. One of the primary reasons for zinc deficiency is not consuming zinc rich food. Most processed foods are zinc fortified. Some of the natural sources of zinc would include pumpkin seeds, beef, chicken, oysters, spinach, mushrooms, cashew nuts, lamb, and yogurt. Apart from this, there are genetic conditions such as Acrodermatitis Enteropathica which also triggers such deficiency. This genetic condition essentially affects the zinc carrier protein within the human body, thus, creating zinc deficiency symptoms in men. Apart from all these common symptoms, there are various researches which link other serious health conditions such as alopecia, paronychia, hypospermia, intellectual disabilities, damage of the nerve, impotence, macular degeneration, hypogonadism, delay in sexual maturation, and impaired nerve conduction. One of the sever symptoms of zinc deficiency especially in children is Growth Retardation. For an adult male, zinc intake should be limited to 11 milligrams each day. For an adult female, this intake should be limited to 8 milligrams per day. In the natural course of life, this quantity of zinc is naturally consumed from our regular dietary intake. However, it is advisable not to take over the counter zinc supplements without consulting a professional medical practitioner. Since excess zinc in the body can lead to a reduction in the levels of copper and iron in the human body. Further, there are certain substances which inhibit the absorption of zinc in human bodies such as food rich in caffeine and phytates. How to Treat Zinc Deficiency in Men? Zinc deficiency needs to be identified prior to treating it. Once the medical practitioner suspects a deficiency of this vital nutrient, he/she would ask the patients to undergo a thorough blood plasma test to identify the zinc levels. Zinc levels are also tested through the urine and/or hair strands of the patients. At times zinc deficiency is also a precursor to other serious health ailments. In fact, according to WHO, zinc deficiency is so prevalent in the US that it can easily be termed as an epidemic. Merely having fortified foods with additional nutrients does not essentially mean that such additional nutrients are absorbed by the human body. As mentioned above there are specific health conditions where the zinc carrier proteins are either absent or are unable to carry zinc around the body. 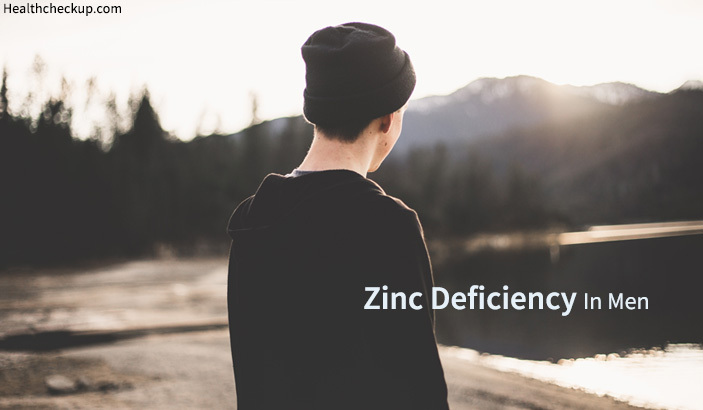 While treating zinc deficiency, it is important to increase the dose of zinc consumption by adding zinc supplements either through the normal diet of the patients and/or supplementing it through prescribed medicines. Which should be consumed only under medical supervision. However, it is important to note that prolonged consumption of zinc supplements can lead to depletion of copper levels in human body. Thus zinc supplements should be coupled with sufficient copper levels in order to treat a zinc deficiency in men and women across the world. Do I need an Endoscopy for Acid Reflux?